The risk of Monilinia blight infection has past throughout mainland Nova Scotia. Cape Breton may still have some late areas that are at the tail end of the infection period. If growers see an extended wet period in the coming days a second application may be required. Growers should be seeing signs of infection if controls were not adequate. 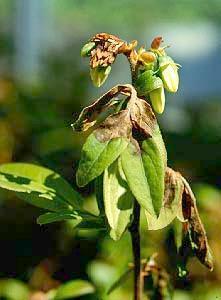 Unfortunately we are not able to provide Botrytis Blight updates this year, however I would refer growers, particularly in the Parrsboro area, to refer to the "Botrytis Blight of Lowbush Blueberry Factsheet" to refresh on when to apply controls. Also as a reminder growers should be monitoring fields for Flea beetle and spanworm. Refer to the insect and disease management guide for optioins if you do need to apply a control. Refer back to this blog often for updates throughout the growing season. This will be the last regular blight update for 2011.